Pierre Huyghe's Unpredictable Ecosystems at LACMA — Drew Tewksbury. Journalist, Editor, Producer, Photographer. Outside the museum, bees are buzzing. Inside, spiders crawl on the walls, plants spring from the floor, and a white dog wanders between the artwork. Los Angeles County Museum of Art's large-scale display of French artist Pierre Huyghe's wide-ranging art is not simply an exhibition; it's a laboratory, showcasing the captivating and cerebral microcosms that populate his larger universe. Visitors will witness: aquariums with floating rocks hovering like Rene Magritte's boulders; an Atari joystick hanging from the ceiling that controls a monochromatic disco-dance floor grid of overhead lights; a skating rink of black ice; and an outdoor sculpture of a woman with a swarming beehive on her head. Huyghe doesn't play it safe. In Huyghe's world, anything can happen. More than 50 works culled from Huyghe's 25 years of art-making including films, sculptural works, performative pieces, and objects are featured in this exhibition on view from November 23 2014 - February 22, 2015. As LACMA director Michael Govan says, Huyghe is "one of the most significant artists working today anywhere. He takes on the big topics of our time, somewhere between media and our biological selves." The exhibition marks the first U.S. retrospective of Huyghe's works and was organized by the Centre Pompidou, which debuted the show last year. But Huyghe's art has special resonance here in Los Angeles, says Jarrett Gregory, LACMA's associate curator of Contemporary art. Huyghe "articulates a tension between urban and natural environments," she says, reflecting on California's own environmental juxtapositions. Outside the Resnick Pavillion, Huyghe's work "L'Expedition scintillante, Act 1 (weather score)" includes three machines that create weather so often absent from the Southern California sky. As snow, fog, and rain fall from the machines, Los Angeles' blindingly blue sky glows in the distance, with a row of palm trees and Michael Heizer's towering rock providing an uncanny, impossible landscape as a backdrop. Huyghe is a disruptor. At LACMA, his target is the traditional museum setting. Before entering the exhibition, a bow-tied man announces your name as you proceed into the darkened space. With the haphazard, angular placement of walls, and off-kilter arrangement of works, the space confounds, and presents moments of discovery. Fragmentation and interruption are all part of Huyghe's plan too. A man walks by wearing a glowing square for a face. A slender white dog with a pink painted leg sidles up next to you. Each journey through the space reveals a different experience. Viewers could even miss the small hole drilled in the wall, from which live spiders and ants emerge. Around a corner, a Turrellian cube glows orange. Upon closer inspection, it's a cloudy marine ecosystem, with fish and Monet-style water lillies thriving inside. The hermetic coldness of minimalism is warmed with life. Huyghe's interest in science, nature, and environments pillar many of the LACMA works, which often include living beings. Huyghe favors animals that are architects, including bees, spiders, and ants, who construct hives, webs, and colonies. Like humans, these insects react to natural elements by creating their own living spaces and urban centers, building systems that keep them alive. 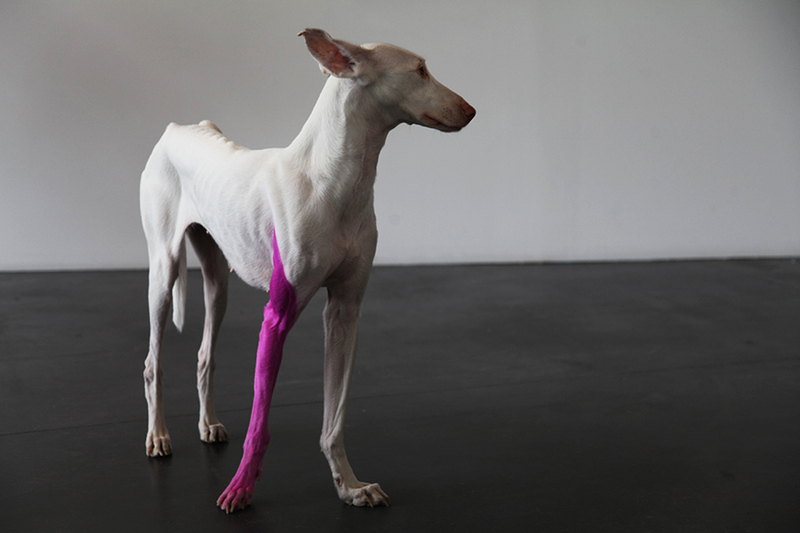 Huyghe's animals are resilient and innovative too. Even Huyghe's hermit crab is a kind of itinerant nomad, looking for a place to call home. In the artist's aquarium habitat, Zoodram 5, the crustacean takes up residence in Huyghe's replica of Constantin BrâncuÈ?i's 1910 sculpture of "Sleeping Muse." The crab lugs around the modernist head sculpture, its crimson claws and tendrils spilling out from its neck, almost like the spinal cord and nerve tissue that connects the brain to the body. This biological analogue also appears in Untilled (Liengender Frauenkt), where Huyghe places a beehive on the head of a sculpture. The brain itself is a sort of beehive of activity arranged in a honeycomb-like structure of synapses and neurons, where thoughts, emotions, and dreams swarm within our skull. The body also functions as a hierarchy as well, where the brain is the queen bee of the body, managing the organic machinery of everyday actions. Huyghe's bees activate our own reptilian brain inspiring the most base level of emotion: fear. The beekeepers on hand keep the bees docile, so you can even take an exhilarating walk among them. Then there's Human, the ghostly Ibizan hound with a Ziggy Stardust-pink painted leg, who inspires the opposite feeling: affection. She seems to float through the gallery, completely silent, occasionally stopping to size-up visitors, perform the quite literal downward dog yoga pose, or curl up for a nap on fur-like mounds scattered around the exhibition. Whenever Human enters a room, she becomes the center of attention, her delicate motions provide a balletic poise, before she floats away to her next destination, skulking around like the ubiquitous gallery dogs or cats often found in commercial art spaces. Like Francis Alÿs' "Nightwatch", where a fox was let loose afterhours in London's National Portrait Gallery, and observed via security cameras, Human breaks the so-called sacredness of the space, adding an element of unpredictability into Huyghe's grand experiments. And here, among Huyghe's zoological and meteorological manipulations, the viewers are the ultimate subjects. From Artbound, KCET, published November 20, 2014.